It is quiet during the day with the boys not here. That gives me a chance to catch up on chores. But I’d rather have the noise of kids running around and squeeze in chores on the edges. 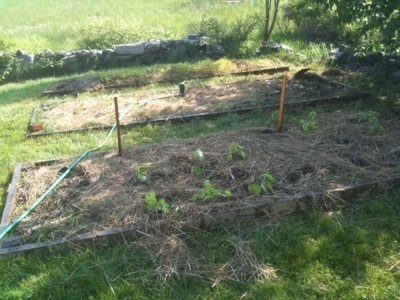 I picked up (and planted) tomato, pepper and celery seedlings from the Sawyer Family farm. I also picked up a freshly slaughtered chicken – dinner one night for the boys and me. I mowed most of the yard this weekend (a little left to finish next week). The yard is coming together. The garden is planted. The flower beds are getting cleaner (ok, still work to do). I also covered the hole in the second floor of the barn where the original stairs had been. I am getting ready to install a large (4′ x5′) window in the south facing wall. I will hinge it so I should be able to get a nice breeze in the summer. I had to repair glazing on the window and paint it. In addition I removed four of the glass storm windows and installed screens (I have only 3 screens, so I’ll have to make more this summer. It finally feels like summer here. Now for pizza and beer while enjoying the evening from the patio.